WataugaWatch: A Leader For the 21st Century ... NOT! A Leader For the 21st Century ... NOT! 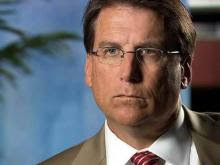 What a mensch isn't Pat McCrory! Despite hiking his skirts during the bash-gay-people one-ring circus in Raleigh, he still managed to get the discrimination-against-gay-people ICK all over his polished, corporate self. It may have been Laura Leslie who single-handedly forced him out of the closet (so to speak). To steal shamelessly from Sir Toby Belch, "Some are born bigots. Some achieve bigotry. And some have bigotry forced upon 'em!" Where the hell is Bev Perdue on this issue? SILENT!! When Is a Lie a "Discrepancy"? When Did Dan Soucek Choose? Did McCrory Rent the Dog? Can You Find Dan Soucek?